You are here: Home » LDV Blog » Newsletter » Light the World! 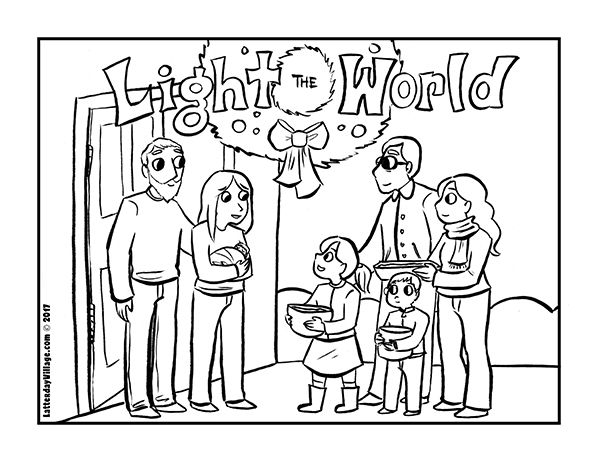 Use this "Light the World" Coloring Page by our own Brittany Olsen to introduce this month of 25 suggestions for serving others this holiday season! Today I drove up Oak Creek Canyon to this place where they installed a spigot along the road that is constantly streaming out the most amazing pure water from a deep natural spring. I take as many glass bottles as I can find to collect as much water as I can when I go. After filling 2 gallon jugs, and four quart bottles and 4 pint bottles, I went on my daily hike. I met a very talented young man last night, and he was there again in the parking lot where I love to hike this evening. He is a painter and showed me his paintings, I even bought one! Then I remembered about the Light the World campaign and asked if he'd like a bottle of spring water I collected today - he said sure! I like how the full moon is peeking out above the juniper tree in the background - perfect for #lighttheworld! I had no idea this morning how I was going to do this little challenge! It was pretty awesome when the way presented itself! 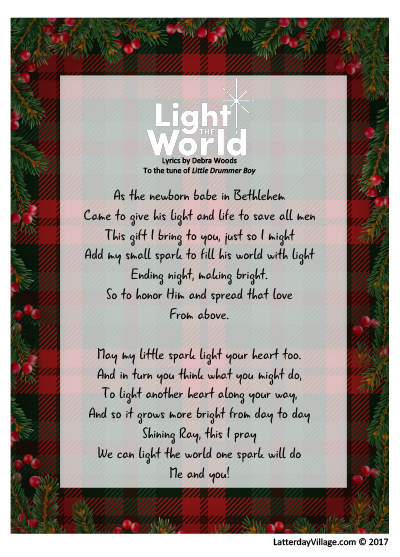 This little card has new lyrics by Debra Woods, LDV Founder, to the beloved song, "Little Drummer Boy." 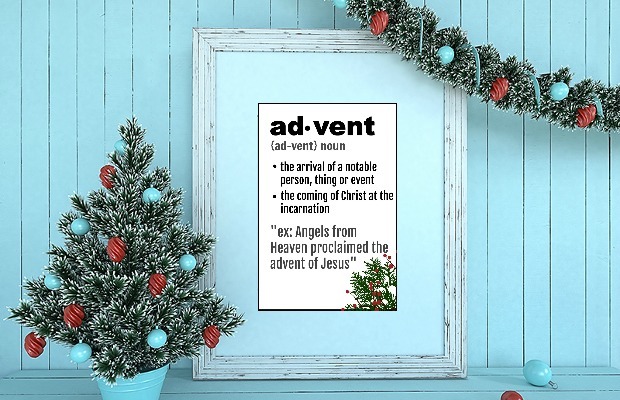 Use it to place on a gift you take to a neighbor, friend or stranger, and if you are very brave, to sing them the song! 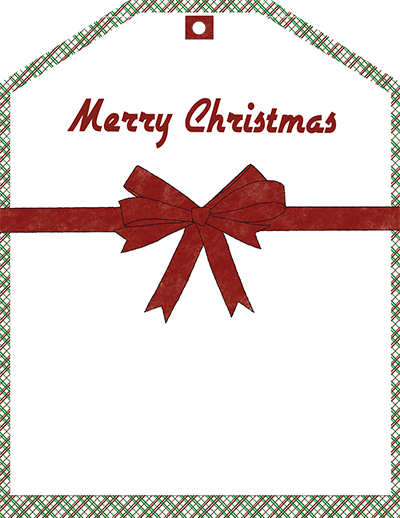 These Merry Christmas gift tags by Jacquelyn Scott come four per page! Add to a gift you leave for a neighbor! Ten festive pages by Debra Woods to write your top 10 Christmas memories and have a Christmas Countdown! 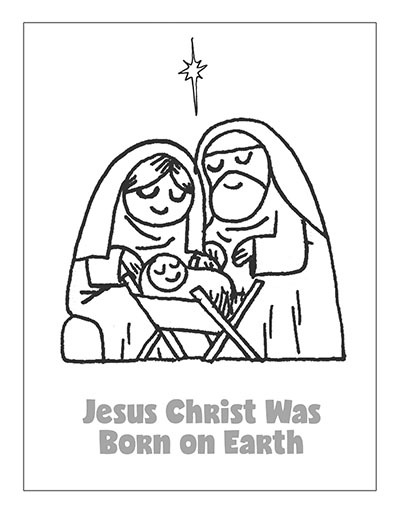 Sweet Coloring Page by our own Mike Laughead - perfect for children to color as you read the Nativity account! This quote comes from an article on Meridian Magazine A-loving-perspective-on-difficult-children that really touched me, so I made this card with a beautiful portrait by our own Serene Heiner with a quote from the author. There are four to a page. These little wreaths come six to a page. Artwork by Elsa Remund. Print on white card stock and cut into a circle. You could adhere to a larger solid color or glitter paper for more strength and beauty. Punch a hole in the top and string a thread through to make a hanger, or just use a wire hook to hang on your Christmas tree! Sorry folks, I came down with a cold that has just gotten worse each day, so I am skipping days 9-14! "I was naked and ye clothed me"
this little Christmas card is about "Decking the Halls' was designed by Nathan Vineyard. It comes in a pdf - print on white card stock and send back through the printer for the inside of the card, then cut and fold! Print these ornaments by Bill Andrus of a snow globe with a temple inside on white card stock and back with a glitter paper or put two back to back, and punch a hole in the top to hang with a piece of gold twine from your tree! Snowflake Gift Tags by Serene Heiner - print on white card stock, cut out, label for all your Christmas giving needs!